Cycling enthusiasts would usually notice designs that are created around bikes. The obvious thing which one would usually carry with them while riding the bike is water but Jesse Herbert didn’t find anything wrong in carrying a bottle of wine too. 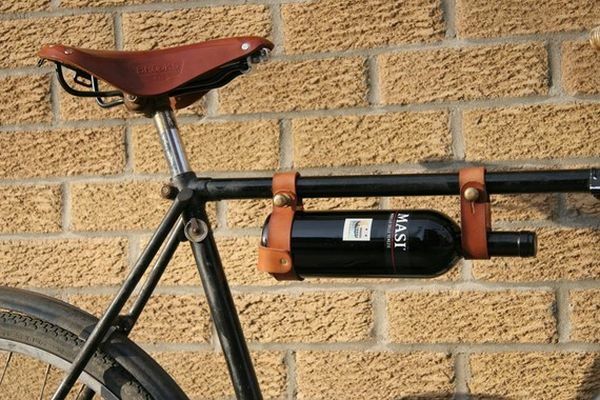 The uber cool designer therefore came up with this handmade leather bicycle wine rack. With the scorching summers going on, a six-pack beer rack would have made more sense but we are still impressed with the idea. 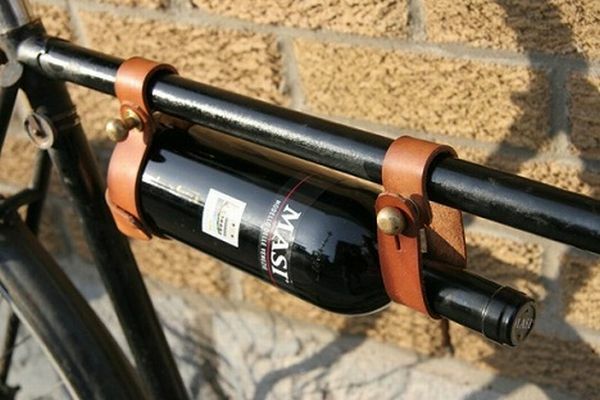 The Leather Bicycle Wine Rack can be strapped to any 1-inch bike frame with help of antique brass fasteners. There are hidden metal clamps here which make sure the wine bottle stays safe and intact. So unless you’re knocked down or something like that you can be confident that the bottle will reach wherever it is supposed to sans a single scratch. It can be adjusted to fit different types of 3” bottles. It is hand crafted out of recycled oil-treated vegetable-tanned leather and recycled antique brass hardware. The first 400 units were priced at $25 CAD for they were made of recycled brass metal scrap. The makers have hiked the price to $30 CAD for they are now buying the brass components from the market. This Bicycle Wine Rack has also scored good points on the environment-friendly quotient for it was made with metal picked up in scrapyards and chemical-free, non-dyed leather. The designer Jesse Herbert has earlier worked for Environment Canada and Natural Resources Canada before he began pursuing design. He has earlier created leather goods like cuff bracelets with built in USB keys, yoga straps, a strap-on purse and the brilliant Bicycle Wine Rack being the latest one. Herbert conceded that his source of inspiration is found objects and not some materials which can be easily bought off the retail shelves. If you like wine and looking out for more fun products like this, check out the list of 19 weird wine bottle openers, which will introduce you to some of the most bizarre bottle openers which are souvenirs in itself.